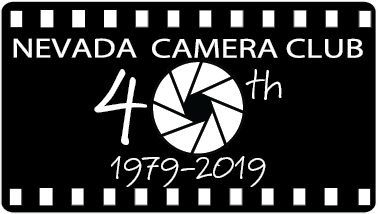 The Community Liaison's goal is to raise awareness of the Nevada Camera Club in the greater Las Vegas photographic community, not only to reach potential new members, but also to discover good speakers, workshop opportunities and other photography-related activities for our existing members. The NCC Annual Awards Banquet is held in December. Members and their guests are welcome. The Community Liaison and other club members reach out to the retail community and NCC members to acquire gifts for the annual raffle held at the banquet. It is our only fundraiser; banquet attendees buy the raffle tickets. There are multiple screens showing all the ribbon winners for the year and various awards including our Photographer of the Year. The president-elect announces the newly elected NCC officers. GOLD LEVEL: B&H Photo , Breathing Color, and Capture One. SILVER LEVEL: Adobe, B & C Camera, Borrow Lenses, Canon, Photodex, Sigma, Think Tank Photo and Zenfolio. BRONZE LEVEL: Arkon, Cashman ProPhoto Lab, Digimarc, G Technology, Hoodman, Lensbaby, Macphun, Photoshop Cafe, Red River Paper, Spider Camera Holster, Squarespace, and Topaz Labs.